Here's a small but useful addition for you Google+ users: You can now use Google Calendar to schedule Google+ hangouts, and easily join them with one single click. If you use regularly use Google+ hangouts for business meetings or social get-togethers, this new feature is going to make setting those up a whole lot easier. From now on, when you want to schedule a hangout with someone, you no longer have to tediously type it into your Google Calendar. 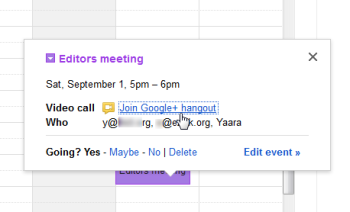 Instead, simply create a new event and click "Edit event," and you'll find a new "Add a new Google+ hangout" option. Clicking this link will immediately add the hangout to the event, which you can proceed to edit as usual. When it's time for the hangout to take place, you don't even have to go to Google+; just click on the event in your calendar, and you'll find the option to "Join Google+ hangout." Clicking on the link will load the hangout page, complete with all the event's participants. This is where it gets really neat: You don't have to invite everyone to the hangout all over again—all you need to do is invite them to the calendar event. Once your friends click the link in the notification email, they'll join you in the hangout automatically. To use this feature, you would naturally need to have a Google+ account, as will all the participants in the event. While Google+ might not be as popular as Facebook, by making it irresistibly convenient to use its products, Google is effectively ensuring that we're all "upgraded" to Google+, whether we want another social network or not. 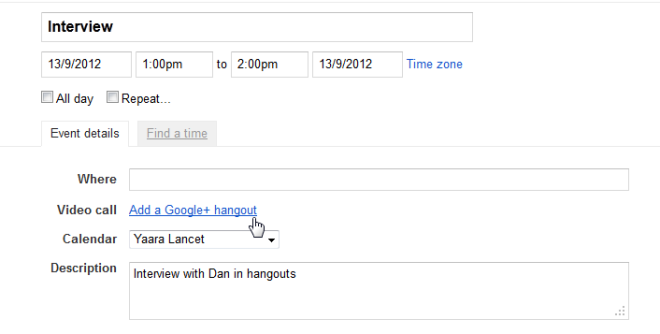 This story, "You can now join Google+ hangouts directly from Google Calendar" was originally published by TechHive.